Inder Loves Folk Art: Holiday Dress. 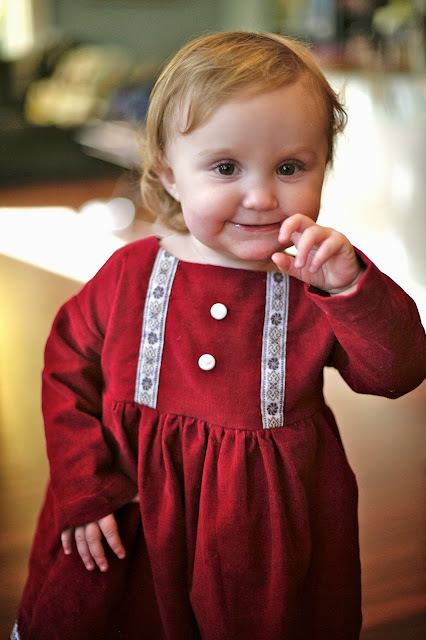 Well, it has not been a stellar Christmas for sewing, due to sewing machine problems in addition to the usual craziness of this time of year, but I did finish one thing: A holiday dress for Maggie in cherry red baby wale corduroy, using Oliver +s' newish pattern, the Playtime Dress (in size 12-18 months). Whew. This was one of those projects. You know what I'm talking about. Super simple, but things kept going wrong. Sewing on my sister's cranky old machine is no joke, folks. And my serger was being a little grumpy too (I think I've resolved the issue since, thank goodness). So this was a struggle. The inside looks like something I would have made about three years ago (which is fine, but it's funny how your standards change, isn't it?) and please don't inspect my buttonholes - take my word for it, they are terrible. Thank goodness the buttons cover them up. Oh my goodness, how I have taken my reliable sewing machine for granted! But it's done, and I love it, perhaps more for all of the struggles. In what seems to be a regular thing with me, I did not buy this pattern right when it came out. I held back, thinking that it was very simple, and I have many similar patterns for dresses and leggings. But as you all know, I am a major sucker for a blog tour and it didn't take very long for me to change my mind. The boat neck, generous fit, and subtle dropped shoulders took me in. The style is relaxed, comfortable, and a perfect foil for pretty details. Ana Sofia's version with beautiful eyelet trim on the bodice clinched the deal and inspired my first version of the dress. I was going for something folksy-vintage here, like something my grandmother would have made for me circa 1979, and I think I nailed it (okay, she would have used velveteen, and there would have been a little bit more lace, and trim, but the vibe is there). 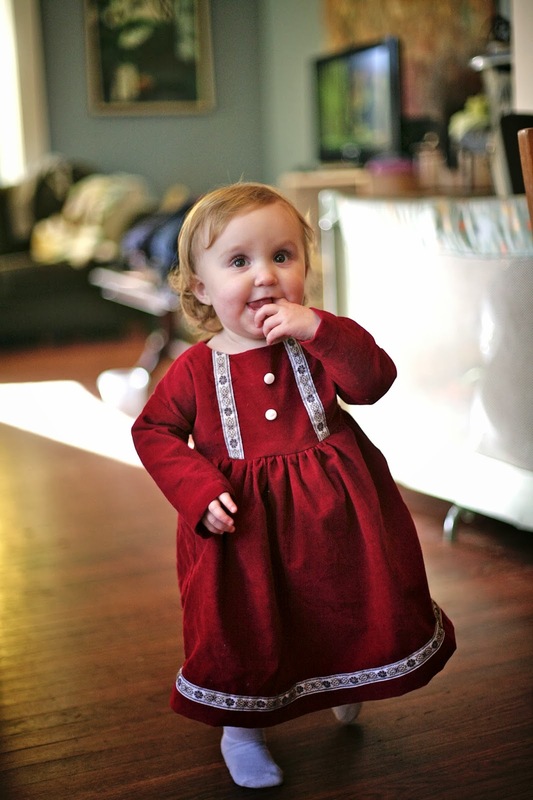 I wanted a dress that would work for parties and nice occasions (beyond Christmas), while still being soft, comfortable, warm, and, of course, washable. Can I stop to gush about this fabric? This corduroy is just scrumptious. Photos don't do the rich shade justice. I want a whole wardrobe in this fabric, preferably with long skirts that swish as I walk. It is like something out of a costume drama - rich and luxurious. This beautiful ribbon was a gift from our housemate Rebecca, who got it in Ecuador. I had just enough for the bodice and skirt of this dress - it was meant to be! 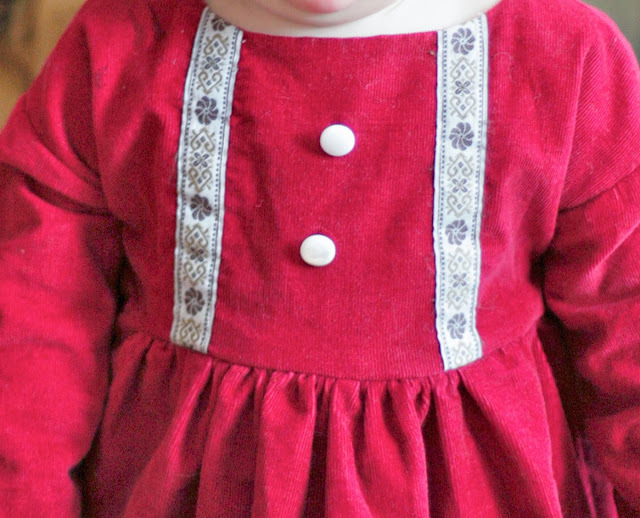 I love the way the cream and brown ribbon looks with the red corduroy and mother-of-pearl buttons. I skipped the pockets and the topstitching of the facing, instead tacking the neck facing down by hand, for a more formal look. Well, I may not have sewn quite as many things as I had hoped this Christmas season (although it's not over yet, so who knows? 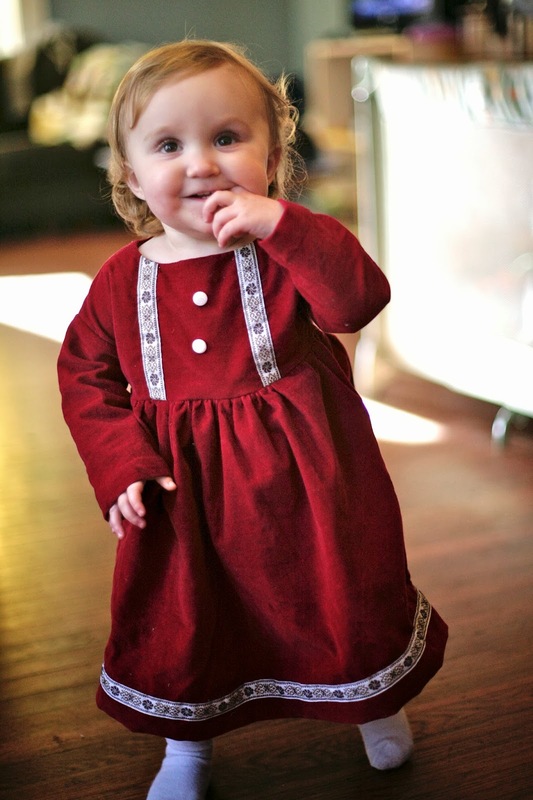 ), but I am really happy that I made my little Maggie a pretty little dress, at least. In sewing machine news, my regular sewing machine is home now and appears to be working again! I was not particularly satisfied with the explanations the shop gave me about their failure to fix it the last time (they claimed I had threaded it incorrectly, which seems a bit unlikely on a machine that I have been successfully sewing on for years now), but if it works now and they've fixed it, all is forgiven. I'm still gingerly trying things out, hoping that all is well and I am back in business for real this time! If so, I couldn't ask for a better Christmas present than having my number one hobby, restored to me! It was well worth all that work, it came out beautifully! Hopefully you'll have your old sewing machine back soon. Oh, Maggie! You could be wearing a papersack and you'd still look adorable. You have indeed captured the 1979 home-sewn vibe here, it's exactly what I thought when I saw the first photo! 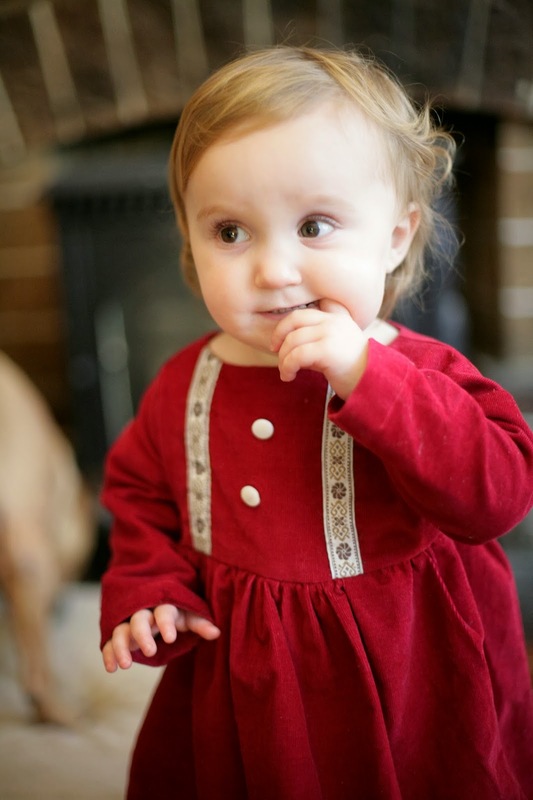 Just like something I would have worn as a 'birthday dress' as a kid :) Is Miss Maggie getting some molars, chewing her finger like that? I'm very glad to hear your sewing machine is back and working. How about that Grasshopper...? Inder, this dress is amazing! 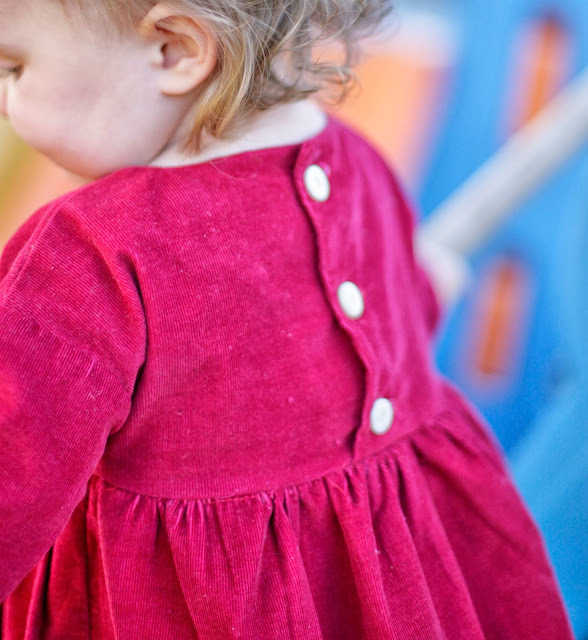 It may be my favorite Playtime Dress to date. It's gorgeous! Buttonholes gone awry may just be one of my biggest sewing frustrations - and why I often prefer zippers. The dress looks fantastic. Way to persevere! Love it. This is my favorite O+S pattern and your version is beautiful. I am not sure how I missed it before!